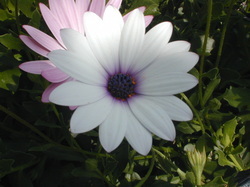 Also known as African Daisy. This is very easy to grow and spreads like wildfire so it is great as you can pass it on to your friends too! It supposedly flowers from Autumn to Spring so it is great to add colour to the garden in the winter. Mine tends not to flower in August. I leave it until end of September and then chop it back to next to nothing and then back it comes - stronger than ever. The colours are amazing - pink, mauve, white, gold - at it height it is completely covered with flowers and you can hardly see the leaves - a very beautiful sight. Any pieces you cut off can be put in water and will then grow roots - give to a friend or plant elsewhere in the garden. It grows as a sort of bush or as ground cover. The really great thing is that no weeds come through it!!! 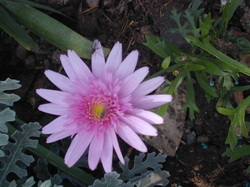 This flower is also known as Paris Daisy, Margarita and the easiest ones to grow are the pink ones for me. 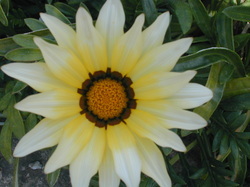 They also come in white, yellow and apricot. Again, this tends to grow into a round bush totally covered in flowers. The bushes usually last about 3 years and then tend to get a bit messy. I always make sure I take plenty of cuttings - by breaking a bit off and putting it in soil in October. I remove all the dead flowers throught the year to give the plant strength. Normally flowers from late spring to early autumn. However, mine have just started flowering again in December!!! Not sure what this one is called at the moment - very pretty border plant though. Again this normally flowers at the beginning of sring but, this year it is flowering in November. 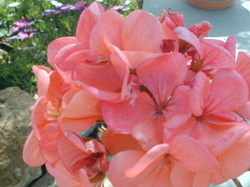 One of the many beuatiful coloured geraniums that grow in Greece. They are so many varieties and they actually seem to seed by themselves here. My plants actually grow into almost hedges - I chop them down to their base every year and they come back stronger than ever. Nevermind about pruning anything in Greece - it seems that the more you cut off, the more that grows back!!! They add so much colour to the garden all year round - pinks, vibrant reds (there is a red one that does not shed its' petals and is shaped like a round ball), orange and white. They are fantastic in flower arrangements. Again, apart from seeding themselves, any pieces you cut off - just stick them in the soil somewhere else or in pots and they will grow!